Italian studio JM Architecture has completed a three-bedroom villa in the northern Italian town of Jesolo, using tiles by Dutch manufacturer Mosa to cover floors and walls. Briefed with creating a house for a young family, the architects opted for materials that would be easy to maintain and clean. 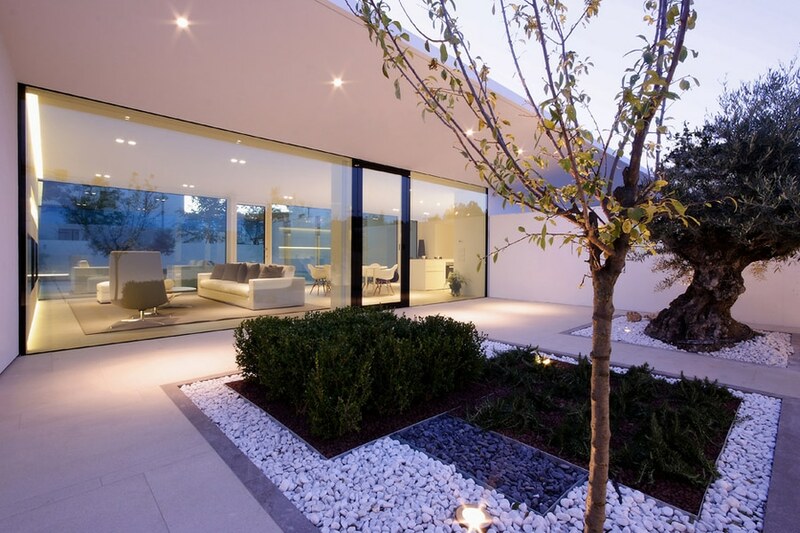 Tiles from Dutch manufacturer Mosa's Quartz collection were used throughout the exterior and interior of the property. "Wood was eliminated from the start as the clients felt it created maintenance and humidity issues," said architect Jacopo Mascheroni. "This limitation became a great advantage in the end as we chose to use Mosa's tile collection." The pale-coloured ceramic tiles allow light to reflect around the property, and were used to soften its white facade to avoid it becoming "clinical". "On one side the whiteness helped to create that feeling of openness but on the other side we understood that it could also feel sterile," said Mascheroni. "The solution was to find another material that played with the whiteness," he added. "We didn't want to reject the whiteness, we wanted to use other materials to enhance its qualities and vice versa – that's why we introduced Mosa ceramics into the design." 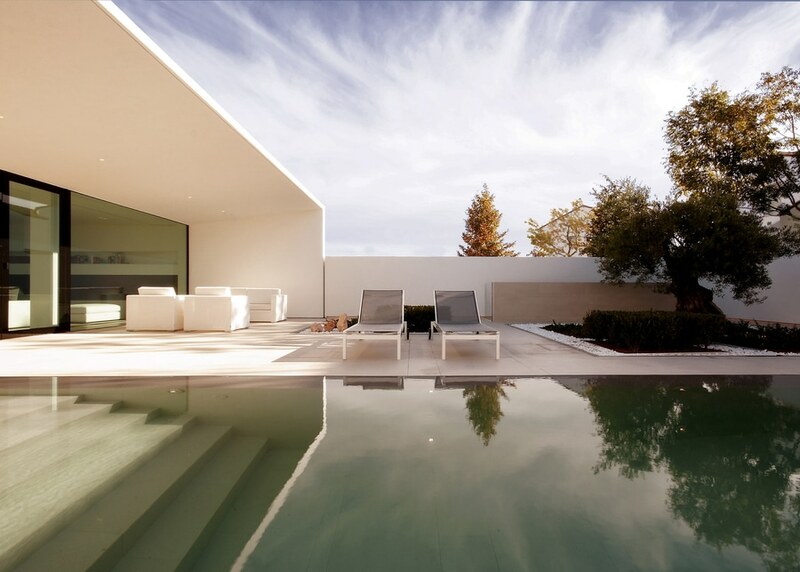 A glazed wall on one side of the of the house allows access to a swimming pool and garden area. A second rectangular block runs parallel to the courtyard and houses the bedrooms and bathrooms. Mosa previewed two new tile collections titled Scenes and Solids at Salone Del Mobile in April. To see the brand's full range of products, visit the Mosa website. Italian studio JM Architecture designed a three-bedroom villa as part of a larger planned development in Jesolo, a town that stretches 9.3 miles with a width of 0.3 miles along the Adriatic coast, close to Venice in Northern Italy. Their clients, a young couple with newly born twins, were clear about two things in their brief: They wanted a very low-maintenance house, including the outdoor areas; and they wanted to eliminate the use of wood as far as possible – bar the prefabricated wood construction of the house. Question: There seems to be a lot of emphasis on outdoor space in the design. Why is this? Jacopo Mascheroni: The objective was to create one fluid space, where indoors and outdoors is very much aligned – in terms of geometries, materials and tones. Working with a small site of 5920 sqf meant that the challenge to create openness was doubled. What really helped at this stage was our knowledge of materials and how we could use them to build and cover the entire site without creating the impression of enclosure. We already had a vision to use Dutch-based company Mosa's ceramic tiles, for example, so those informed decisions made the task at hand a lot easier. 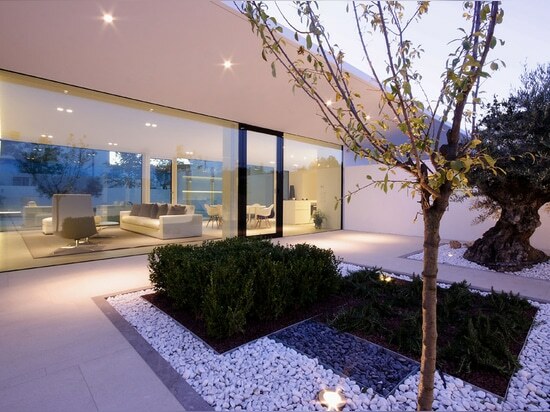 Having such beautiful surrounding views definitely encouraged the idea to emphasise the exterior too. The house has an L-shaped plan, however, it can be read as a rectangular block as one side utilises a large canopy with glazing beyond, giving the impression of transience to help create this openness we wanted to achieve. The block by the pool offers a necessary contrast though, both aesthetically and functionally, as it houses the private spaces such as the bedrooms and bathrooms. 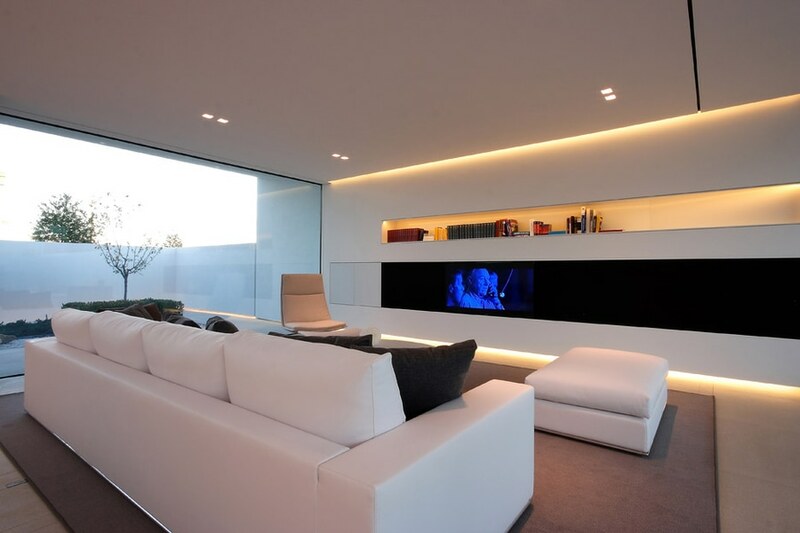 Question: The house appears very white and transparent. How have you managed to create a non-clinical atmosphere? Jacopo Mascheroni: On one side the whiteness and transparency helped to create that feeling of openness but on the other side we understood that it could also feel sterile, especially without the use of wood finishes in the design. The solution was to find another material that played with the whiteness – we didn't want to reject the whiteness – we wanted to use other materials to enhance its qualities and vice versa. And that's why we introduced Mosa ceramics into the design, our prior experience with the material definitely pushed our thinking towards using an entire 'ceramic skin,' as Mosa refers to it. Question: So you chose ceramic tiles to create warmth, as an alternative to wood? Jacopo Mascheroni: Wood was eliminated from the start as the clients felt it created maintenance and humidity issues. This limitation became a great advantage in the end as we chose to use Mosa's ceramic tile collection, named Quartz. 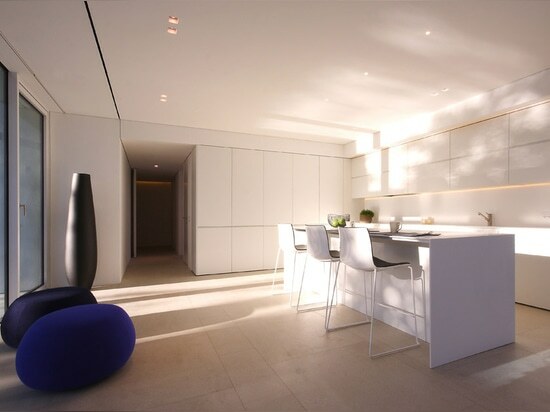 The material not only solved our functional needs, but it also offered a very original aesthetic - it was able to reflect a warm light onto the whiteness. Using Mosa presented a 360-degree solution: we could use the tiles indoors and outdoors; on walls and floors; in the pool and around the pool. There were a variety of sizes, tones and two surfaces available: smooth and rough. Both natural and artificial lighting worked with the tiles to produce a homely atmosphere – away from monotonous white and sameness. This is where we really had to think about the relationship between the materials we wanted to use and lighting. Question: And how did you do this? Jacopo Mascheroni: We had to look at how the house would feel during all the seasons, in natural and artificial lighting. In Northern Italy, it gets dark after 5pm so for six months of the year you use artificial lighting. 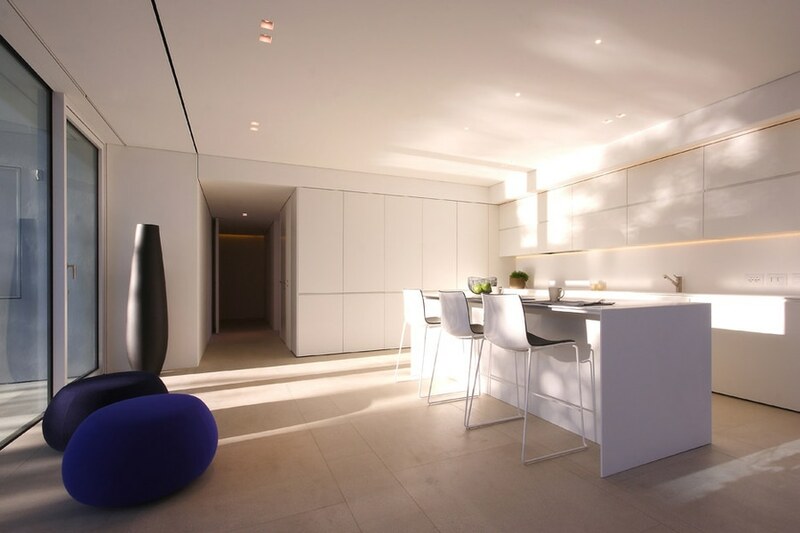 This meant that it was vital to observe how the house would look and function through artificial lighting, but we made natural lighting a priority, as this is what truly creates the atmosphere with the materials. Question: It's quite a large commitment to use the same material throughout a house – from inside to outside, covering nearly the entire plot. What influenced this decision? Jacopo Mascheroni: The material itself and the people we were working with. We had used Mosa tiles previously and so we were familiar with the quality of the tile. But what really helped was the one-to-one mock-up we were able to create. We had enough samples to create different test pattern arrangements and we left the tiles to observe their reaction to direct and indirect light over a month – the clients also saw this, which really boosted our confidence in what it would actually look like, as opposed to a showroom scenario which can feel artificial. You can always envision how something will look and you can plan for it, but a good result does not come by chance. Question: Is there a pattern to the floor design or is the arrangement quite random? Jacopo Mascheroni: The most important thing to realise when trying to create a beautiful floor is that 50 per cent is given by the material you chose to use and 50 per cent to the pattern that you can give to it. We created a story with our pattern that went as far as to include furniture alignments. The beauty in the tiles is that as well as their own tone and texture benefits; there is a wide range of formats, from two by 24 inches to 36 by 36 inches in square and rectangular forms. played with the combination of narrow strips with larger tiles, combining different arrangements. This created original detailing for the swimming pool and bathroom areas especially, as these areas required both floor and wall tiles so the size differentiations and tones really added depth. For example, a deeper shade was placed around the pool to give it a frame and define it as its own element. Adding to this, around the poolside, we used a rough finished tile that increased tactility to accommodate for the water. This flexibility is what matters when it comes to using ceramics. Question: How important was it to JM Architecture to come up with a design that would be sustainable? Jacopo Mascheroni: All the energy circulates. The entire heating system is electrical – no gas – and this system is powered by the photovoltaic panels laid on the roof. By careful calculations, there are enough panels at the right size to accommodate for seasonal changes in energy use. We managed to understand how many kW of power is needed to run the whole house efficiently and combined with all the passive cooling strategies, the house presents an economical and efficient solution. It was very important to us and relevant to the broader development plan. Using Mosa tiles was another integral and conscious decision, not only owing to their aesthetics and functionality, but also their environmental significance – the tiles are Cradle-to-Cradle Silver certified, meaning Mosa considers the life cycle of its tiles and this was a great asset to our overall sustainable agenda as the material was used throughout. 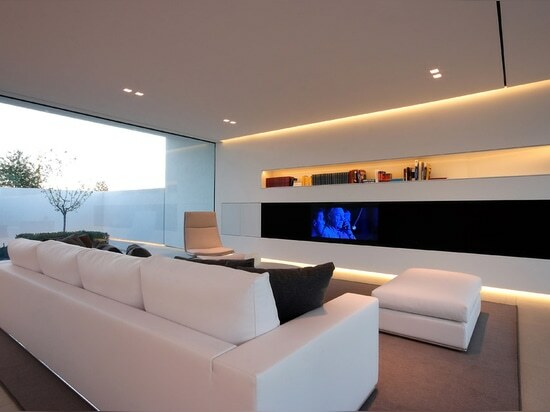 As well as this, we used LED lighting in the house to keep costs down. There is also radiant floor heating for the colder months. Question: The first design has been plotted. What happens next? Jacopo Mascheroni: People understand the language of a space when it is finished. Now we have a prototype to show other buyers what they will actually get, customised to their specifications. Although they will alter in height and size, we will use the same materials, colours, lighting and landscape to create continuity and depth across the whole development – it strengthens the entire concept.